This drug should only be used if other, safer medicines (e.g., permethrin) cannot be used or have not been effective. Do not use lindane to re-treat the same lice infestation after the first lindane treatment does not work. Infrequently, lindane has caused seizures (sometimes death) after prolonged or repeated use. Rare (sometimes fatal) nervous system reactions such as seizures may occur, even after correct one-time use of lindane. Lindane should not be used in premature infants or patients with poorly controlled seizures. In addition, lindane should be used with caution in infants, children, the elderly, patients with skin conditions (e.g., skin rash, psoriasis), and patients with low body weight (e.g., less than 110 pounds or 50 kilograms). Itching may occur after either successful or failed treatments. Avoid re-applying lindane for a few months after use. Who should not take Lindane Shampoo? This medication is used to treat head and crab (pubic) lice. Lice are tiny insects that lay eggs (nits) on hair shafts. Lice can easily spread to those in close contact with you. Lindane works by killing the lice and nits. An infection with lice is also called an infestation. This drug should not be used to prevent lice infestation or re-infestation. Read the Medication Guide provided by your pharmacist before you start using lindane. If you have any questions, consult your doctor or pharmacist. This drug can be poisonous if used incorrectly. Do not take this drug by mouth, and avoid contact with your eyes, nose, or mouth. If lindane gets in these areas, rinse with water immediately and seek immediate medical attention if a burning feeling remains. Do not use if there is skin irritation (e.g., open wounds, rash, cuts, or sores) on the area to be treated unless directed to do so by your doctor. Do not apply any oil-based hair products (such as oil treatments or oil-based hair dressings/conditioners) immediately before or after using lindane. If you are currently using any of these products, they must be washed off before you apply lindane. Oil-based products may increase the absorption of lindane, increasing the risk of side effects. Wash your hair with your regular shampoo (without conditioner) and dry it well. Wait at least 1 hour after drying your hair before using lindane shampoo. Most adults require only 1 ounce (30 milliliters), but those with longer and thicker hair should use no more than 2 ounces (60 milliliters). Shake the bottle well before use. For application, use gloves made of nitrile, latex with neoprene, or sheer vinyl to avoid unnecessary contact with your skin. Do not use natural latex gloves because more lindane can penetrate that type of glove. Apply a small amount of lindane to lightly coat your hair and scalp as directed by your doctor. Work thoroughly (do not lather) through dry hair. Do not add water. Make sure to include the fine hairs along your neck and behind your ears. Leave lindane in your hair for exactly 4 minutes (use a timer or clock). Do not cover your hair with anything (e.g., shower cap, towel). After 4 minutes, add a small amount of warm (not hot) water, rub until a lather forms, then immediately rinse away all lather. Try to keep lindane from touching other parts of your body. Do not re-apply. Dry your hair with a towel, then use the special nit comb or tweezers to remove the nits. It is best to have someone else do this for you to make sure all the nits are removed. They should wear gloves while removing the nits. Close the bottle with any remaining lindane and throw it away out of reach from children and pets. Wash your hands well after treatment. 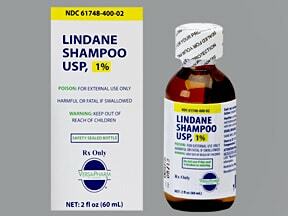 If an infant or young child is prescribed lindane, watch the child carefully while the lindane shampoo is in the hair to make sure the child does not touch the hair then put the hands in the mouth. If you are putting lindane shampoo on someone else, use gloves as directed above. Wash your hands well afterwards. The easiest way to tell if you have lice is to look for small gray-white nits fixed to the hair shafts. Symptoms of lice include an intense itching, mostly on the scalp, but also possibly on the eyebrows, eyelashes, beard, or groin. Itching may continue even after treatment with lindane shampoo. Even if the lindane kills all the lice, the dead lice can still make you itch for a long time after treatment. Ask your doctor about other medications that may be used to soothe the itching. Inform your doctor if your condition persists or worsens 1-2 weeks after treatment. What conditions does Lindane Shampoo treat? This medication may cause stinging, burning, or redness of the skin. Inform your doctor promptly if these symptoms persist or worsen. It may mean that some of the medication was absorbed through the skin. Tell your doctor right away if these rare but very seriousvomiting, dizziness, drowsiness, seizures. 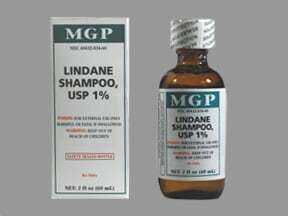 List Lindane Shampoo side effects by likelihood and severity. Before using lindane shampoo, tell your doctor or pharmacist if you are allergic to it; or if you have any other allergies. This product may contain inactive ingredients, which can cause allergic reactions or other problems. Talk to your pharmacist for more details. Before using this medication, tell your doctor or pharmacist your medical history, especially of: other skin conditions (e.g., psoriasis, dermatitis), HIV infection, history of serious head injury, seizures, brain tumors, severe liver disease, alcohol abuse, sudden stopping of regular alcohol or sedative use. Before having an imaging test (e.g., X-rays, CT scan) requiring the use of dye, tell your doctor that you have used this medication. Lindane passes into breast milk and could have undesirable effects on a nursing infant. Your baby should not come into direct contact with your skin while it has lindane on it. In addition, to lessen the chance of exposing your baby to the medication and possible side effects, pump your breast milk and discard it for 24 hours after using lindane. During this time, feed your baby formula or breast milk you stored from before you used lindane shampoo. What should I know regarding pregnancy, nursing and administering Lindane Shampoo to children or the elderly? This medicine may be harmful if swallowed. If someone has overdosed and has serious symptoms such as passing out or trouble breathing, call 911. Otherwise, call a poison control center right away. US residents can call their local poison control center at 1-800-222-1222. Canada residents can call a provincial poison control center. Symptoms of overdose may include nausea, vomiting, restlessness, unsteadiness, seizures, irregular heartbeat. Lice are easily passed from one person to another. All family members and people you have close contact with (especially if you have crab/pubic hair lice) should be examined. After treatment, soak all possibly infested combs, brushes, and other hair care items in water that has been heated to 130 degrees F (54 degrees C) for 5 to 10 minutes. Also, any recently worn clothing, hats, sheets/blankets, plush/fabric toys, and towels should be washed in very hot water or dry-cleaned. This drug is not effective for scabies. Another form of lindane is used for treating scabies. This medication is used to treat a current infestation only. It cannot be used to prevent future infestations. Store at room temperature away from light and moisture. Keep the bottle tightly closed. Do not store in the bathroom. Do not freeze. Keep all medications away from children and pets. Are you taking Lindane Shampoo? Are you considering switching to Lindane Shampoo? How long have you been taking Lindane Shampoo?